The dominant plants of meadows are native, rather than cultivated, grasses, interspersed with a great variety of different herbaceous flowering plants. Most of the plants growing in meadows are fairly common species also regularly found in other habitats. With the notable exceptions of certain now rare species such as orchids, fritillaries and cowslips, the main value of meadows lies in the sheer diversity of their plant life. This affords a local concentration of a wide variety of invertebrate food plants, together with shelter for a great many different invertebrate species. This in its turn means that there is an abundance of food for birds and mammals.The actual plant species composition of meadows will vary from area to area, depending on local geological, soil and climatic conditions. The meadow plants discussed here are those characteristic of lowland meadows in Devon, Southwest England. 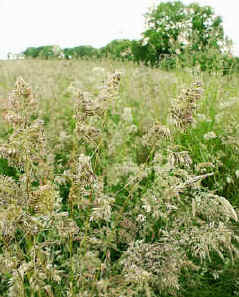 These are characterized by mixures of grasses such as Cocksfoot (Dactylis glomerata), Timothy (Phleum pratense), Common Bent (Agrostis capillaris), Sweet Vernal-grass (Anthoxanthum odoratum) and Crested Dog's-tail (Cynosurus cristatus). While grasses may appear to be superficially similar when they are not flowering, once the flowering heads appear the differences become much clearer. The grasses provide the basic architecture of the meadow. Over the years, thick mats of old, dead, fibrous foliage build up underneath the current year's growth. This provides a large reservoir of decaying material for recycling, as well as winter shelter for a great variety of invertebrates. The grasses are also the foodplants of many of the meadow butterflies. One grass is definitely not the same as another from a caterpillar's view point. Some butterflies, such as the Marbled White, need a mixture of native grasses growing in the same area because the caterpillars favour different grass species at different stages of their growth. 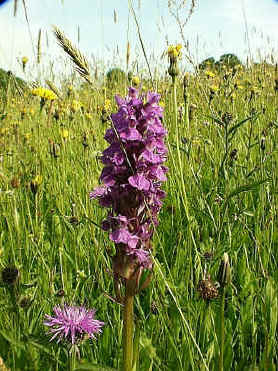 One of the main features of meadows is the sheer diversity of plants which they contain. Mixed in amongst the variety of native grasses are a great many other flowering plants. These include plantains, docks, buttercups, vetches and clovers, dandelions, nettles, Selfheal, Lesser Knapweed, scabious, thistles, hawkbits, Ox-eye Daisies, Yellow-rattle and on rare occasions, Cowslips. As real prizes in amongst the waving meadow grasses, depending on local conditions, a variety of orchids, such as Common Spotted, Green-winged and Twayblade may also be found. When conditions are right they can occur in great profusion.